Summary: The week started off slowly but really took off at the end, with the arrival of several more workers. The big news is that we met with Golf and got him to sign a letter of what payments we'd made to him. We also gave him a copy of our graph that shows what has been spent on Ocelot - about half of what we've given him. After ripping us off like that, he had the gall to ask us to pay him for his time, even though he couldn't explain where $30,000 of our money went. Houa spent the week working on the galley sink cabinet - apparently it's much more complicated than we thought. 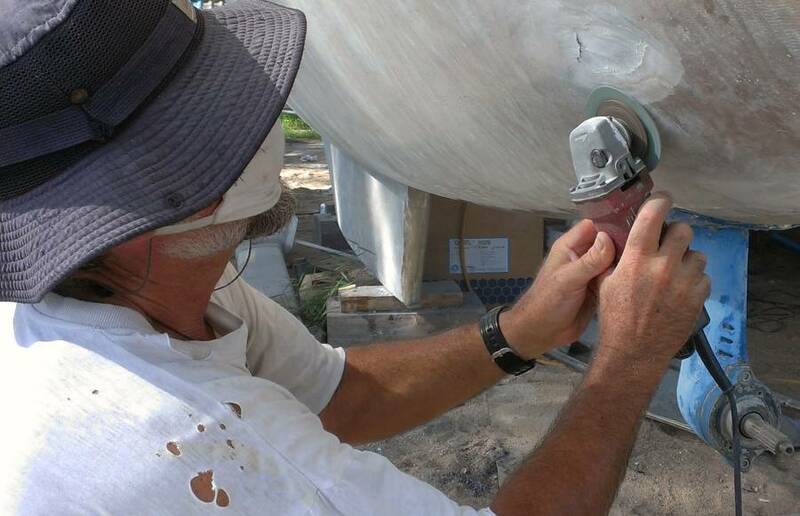 Baw worked on the bimini, removing a bad bump and smoothing the whole surface with gelcoat filler. Jon continued polishing our spars and also ground out and glassed up some whale damage from 2007. We celebrated Loy Krathong by helping launch our neighbors and good friends, and setting our little offering adrift. Sue dug out the hinges and latches for our deck hatches and started cleaning them - several will need to go the our stainless worker for some welding. Sue also spent time cleaning up the toe‑rails, although we're not sure what we're going to do with them. 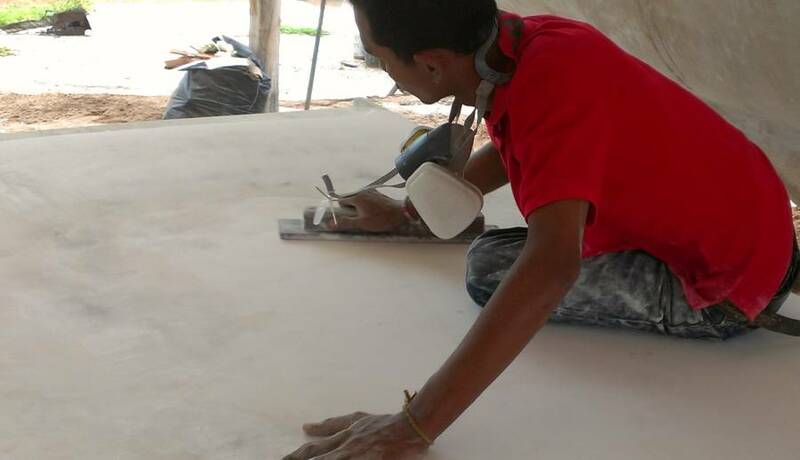 E‑U's team of 3 workers started on Friday and immediately started sanding the deck and applying gelcoat filler to smooth it out. Mike and Wiwat came to tell them what's needed. We cut some sections of large PVC pipe to use as sanding forms, so we get a consistent radius on the transitions from cabin to deck. But a batch of gelcoat on Friday didn't harden so all of Saturday (and Monday and Tuesday) was taken up with trying to remove it from 3 areas, an ugly job. 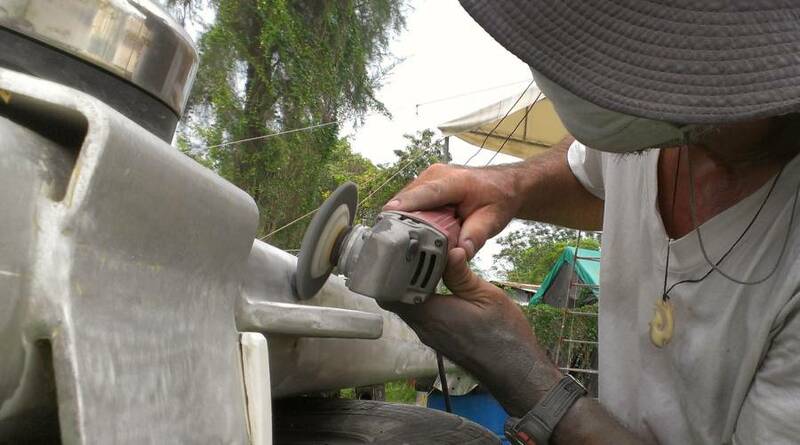 We chose our color for the deck (a warm off‑white, now dubbed Ocelot White) and sent the color sample to the gelcoat manufacturers, but Jon realized that the targa‑bar will have to be re‑sprayed so he started removing all the hardware he'd mounted up there. We also started looking at teak decks to see how we want our cockpit rebuilt. Bit of a slow day at the yard today, mainly because it drizzled for much of the day. Luckily we had no epoxy work planned. Houa continued working on the galley cabinet for the sink. There's still a fair amount of woodwork to do, even before we get to replacing the teak in the cockpit, so we asked Houa if he knew of another woodworker. He said he had a friend he'll talk to. Jon spent much of the day polishing the mast. He finished the top, so everything from the first spreader up is ready for a light sanding, cleaning, and treating with Nyalic. He started to work on the boom but then moved to the base of the mast. This is the most difficult area, which is probably why we've left it to last. It has all the cleats and winches and rope‑locks, so it's difficult to polish right up to them. But it's also the area we're constantly looking at, so we want it done as well as possible. Sue was also working on both the mast and the boom, digging paint out of the corners and sanding the polished surface to remove the mottling left by the polisher - all slow, fiddly work. 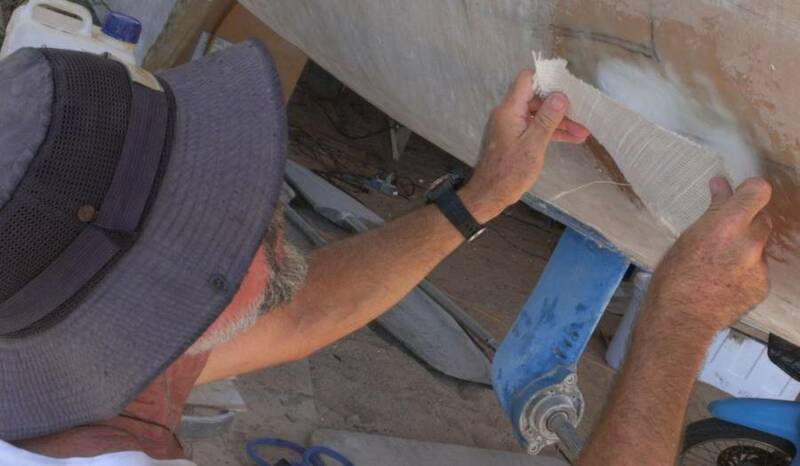 Baw worked on the bottom of the bimini, sanding the gelcoat filler flat. Hopefully he'll be finished soon. Unfortunately, there's a lump in the center forward underside, where a pocket of epoxy got too hot and expanded in thermal runaway. Taking that out will mean cutting back the glass and a bit of foam and then reglassing. We'd hoped to avoid that, but it may be too obvious if we leave it in. We met with Golf this afternoon. We got him to sign a copy of what we've paid him and when. Previously we've just sent these updates to him by email but this time we got active acknowledgement of what we've paid him. Then we showed him our graph of how much we've paid him (over time) and how much has been spent on Ocelot. The graph makes it pretty clear that there's a $30,000 discrepancy. But he won't tell us where the money went - he just goes silent. 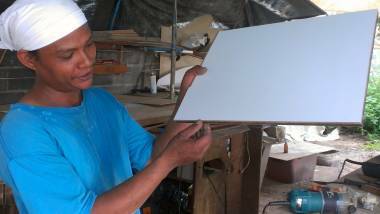 We asked him to please bring our teak and gelcoat, which he's said repeatedly that he has at his house, and he said he'd bring them tomorrow. But when we asked him IF he had the teak and gelcoat, he went silent again. He asked to be paid like a normal worker to finish the work on Ocelot. We told him we have lost trust in him, and that we have to trust the people working for us. We were both very sad leaving the meeting because we feel that we have been betrayed by someone we considered a friend. Golf could resolve this by selling assets, apologizing, admitting wrong doing and returning our money, but he may not be willing to do this. There will be a stalemate until he realizes he has to change something in his life. Meanwhile, we carry on getting Ocelot ready for her big facelift. A day of high overcast and lots of rain, but all in all a bit cooler. No sign of Golf - we're still not sure what's going on there. But apparently the new main contractor at the yard, E‑U, saw us come back from our talk with Golf yesterday. When he saw our long faces he immediately went to Cris, the yard manager, and asked what he could do for us. E‑U has worked for us before and he's a good guy, but he doesn't speak much English. Even so, he'll probably be managing the rest of Ocelot's refit once the 2 boats he's working on go back in the water in about a week. Nice to know he feels that way towards us. Team Hacking accomplished nothing significant on Ocelot, but it was a good day of socializing and strategizing. Socializing happened with a couple from Singapore: Leslie and Jon attended elementary, junior and senior high school together and hadn't seen each other in 39 years! Strategizing had to do with the "what next" aspect of carrying on with Ocelot's refit. Baw arrived after lunch, though we're still not sure why he wasn't there in the morning. But he dug right into his mind‑numbing job of sanding and fairing the bimini bottom. He got gelcoat filler around the sides and over the PVC pipe that will become the bolt rope holder for the sun shades. With our approval he ground back a high spot right down to foam, and tomorrow he'll be glassing it over, then, once it has cured, sanding it fair with the rest of the bimini. Sue was ready to let it go, but it would be right in our faces and this is the time to fix these sorts of issues. 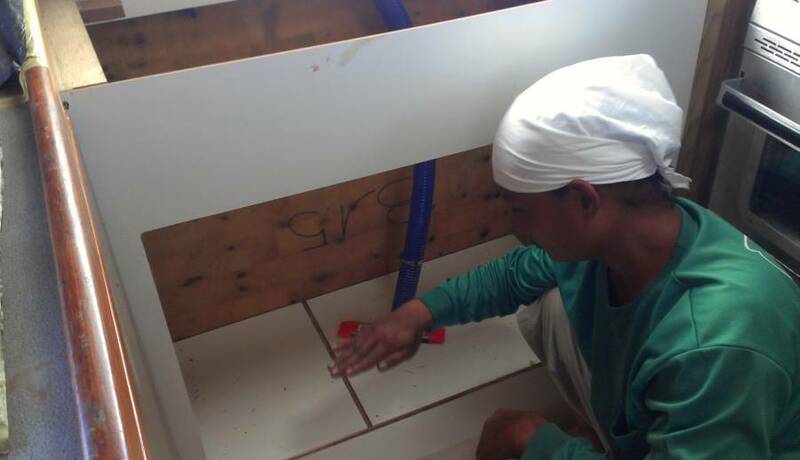 Houa worked on routing the edges of the sink shelves, and gluing things in place. Tomorrow he'll be applying white Formica to the central shelf, and creating the teak railing for that shelf, much like what we had in the old cabinet. Finally, a day with no rain! The exciting news is that some of E‑U's team will be freed up after tomorrow, and we've been promised 3 new workers on Friday. YES! E‑U has worked on Ocelot and he's a good guy. He's always been a contractor‑wannabe, but his English isn't very good. But his guys seem to work hard, and he's well liked, and we have LOTS of things for them to do. We'll probably start them prepping the decks for the new non‑skid and gelcoat. Even with our minimal team, we managed to get some good things done today. But the main distraction was that our Aussie neighbors and good friends were positioned to launch tonight, so there is a big blank hole next to Ocelot, and we're feeling a bit "left behind". We keep telling ourselves "one day it'll be us..."
Baw called in sick in the morning, but showed up after lunch and set to work once again on the bimini bottom. The most visible accomplishment for him for the day was the glassing in of the "bump" that he ground off late yesterday. By 5pm it was still curing, and we are hopeful that it will be good and hard tomorrow morning. These days with high humidity are not great for epoxy work. Houa got the shelf support glued into the galley sink cabinet, and worked on cleaning up the big pieces of teak trim that survived the de‑construction of the galley. There is still a lot of finish work to do, and then the varnishing, but it will be nice to see it all put back together like a real galley! Back in 2007 we were hit by a whale (not his fault - we hit him first) and one bit of damage on port side, near the propeller, wasn't discovered until our last haul‑out. We slapped a fiberglass patch on the crack but today we ground it all back to find out how bad it was. It went down to the foam but wasn't very big. So Jon ground out a big rectangle around it and tomorrow we'll glass it up properly. 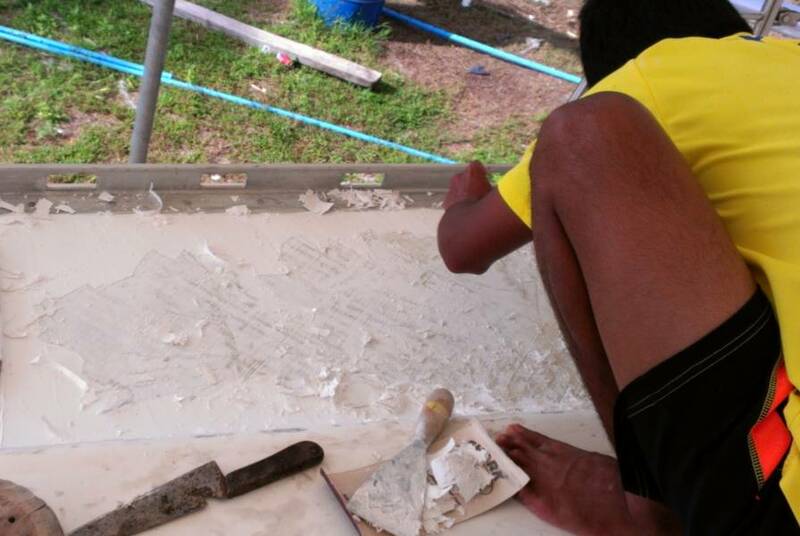 It was nasty work, but we didn't want to pull Baw off the gelcoating or Houa off his carpentry work. Sue got re‑acquainted with the mast today by working with 400 grit paper down at the base. This is the area that we will see more often, so we want it as nice as possible. This Nyalic clear coating is great, except you can't hide any marks, dings, or left‑over paint under it. We had a long talk with Cris, the yard manager. Some of the yard policies are somewhat off‑putting for us free‑spirited cruisers, and Cris is trying to change them to make the yard more appealing, but he's the low man on the totem‑pole, as the owners have their own ideas on how they want the yard to run. In the meantime, we're trying to work within their framework and watching how it all shakes out. A brilliant hot day with both our workers - Yes! Jon's big accomplishment was glassing up the whale damage that he'd opened up yesterday. Our supply of biaxial glass is getting low and we'd rather not buy a whole new roll, so Jon was able to cut what he needed from our big pile of scraps - off‑cuts from other jobs. Baw mixed the epoxy mud to go over the foam and mixed too much, so he used it to fill some of the screw holes that were made in the back of the hull while we were building the stern extensions. Jon put 4 layers of glass on the whale damage and then put some glass over the screw holes as well. One of the things we'll be asking the guys to do is to spray some gelcoat on the undersides of our hatches. This will make them nice and white but we'll lose where our screw holes go, as those holes are now filled with epoxy. So Sue dug out some of our deck hardware (hinges, hatch‑pulls, etc) and Jon started drilling out some of the mounting holes. Once the gelcoat underneath is finished, the holes can be drilled out from the top. 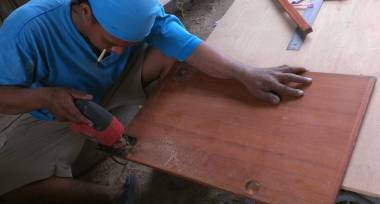 And when the teak covers the tops of those holes, we can drill them out from the bottom. 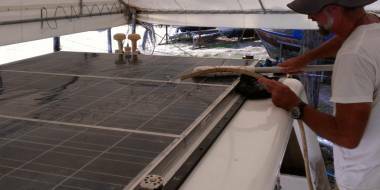 We're having problems with the electricity, a constant issue with this particular boatyard. We're only getting about 160V (or 80V after it goes through our transformer, since we're a 110V boat). That's too low for the battery charger to kick in, and the solar panels can't keep up with the fridge when Ocelot's under her tent. Indeed, we're surprised that the solar panels are working at all, but we're losing about 10 amp‑hours/day. So one thing we did was to clean the dirt and bird poop off the panels with the hose and an improvised mop. Jon also looked for better places to plug Ocelot in, and he talked to the yard manager to see what can be done. Houa's sink cabinet is slowly coming together. Apparently it's much more complicated than we thought. He's doing a wonderful job with bits of teak edging so it should be worth the wait. Baw put in a bit more time on the bimini and then moved up to Ocelot's deck. 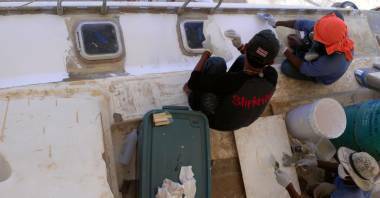 Our high‑priority job right now is to prepare the decks for the molded gelcoat antiskid. This can take a while, as first the gelcoat has to be ordered (wait a week), then the panels of antiskid have to be made (1/day, then wait 10 days for them to cure completely). Then the panels have to be trimmed to fit and the first layers of gelcoat can be sprayed down on the decks. We thought the decks were already pretty flat, but Mike, who will be overseeing (and doing) the work seems to think a lot still has to be done. He'll be coming down tomorrow to talk to Baw and our 3 new workers to tell them exactly what needs to be done. 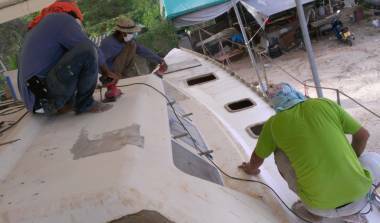 If we finish the decks before the antiskid is ready, we'll move on to preparing the topsides (the hulls from the water to the deck) for gelcoat. They're already sanded pretty flat, but the epoxy filler is too porous so we'll need to roll on a coat of epoxy to seal everything before we apply the gelcoat. 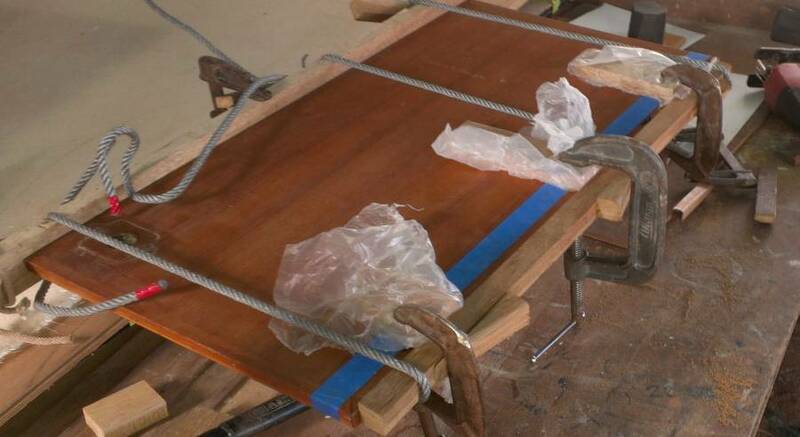 And once the gelcoat comes we can spray a couple of coats on the bottom and sides of the bimini, polish it up, and hoist it up on deck for mounting. Sue spent the morning sanding and cleaning the aft portion of the port toe‑rail. This long fitting runs the full length of the boat, at the outer edge of the deck, and was originally anodized aluminum, but it has been gouged, scraped and inadvertently ground down when the decks were rebuilt. Did we say it's ugly? We could choose to leave it ugly, but one concern is that the exposed, raw aluminum will corrode, making a bigger mess. We may just clean it up as well as possible and touch it up with Nyalic to protect it. Sue's afternoon was spent running back and forth to the storage room for deck hardware, and cleaning out the cockpit locker hatch gutters. All part of prepping the decks for their beautiful gelcoat job! What a roller coater ride on Ocelot. Today was definitely a zoom‑ahead day, feeling almost out of control with activity! WOOT! LOTS of workers today doing LOTS of work! The frenzy of work began on Ocelot shortly after 8:30 with the arrival of our 3 new crew: Chia, Song and Lek. With Baw as lead‑man (he has seniority on Ocelot) they dug right in with sanding and spreading a thin gelcoat filler on the decks. By the time our new deck consultants, Mike and K'Wiwat from AME Marine, arrived there was already lots of white filler all over the forward decks. Mike and K'Wiwat (the K stands for Khun, or Mr. in Thai) will be manufacturing the new non-skid panels that will grace Ocelot's decks, and because they will be in charge of laying them, they have agreed to consult with us (and our Thai workers) for the prep work, which is so important. 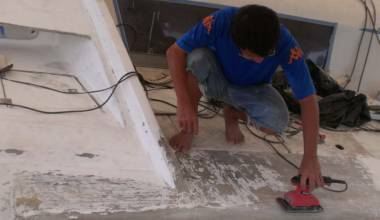 No point in spending good money to get beautiful vacuum‑laid panels if the underlayment isn't done well. So, with Mike's Thai language skills, and K'Wiwat's good English we THINK we got all the messages back and forth from us to them, them to the Thai workers, and workers back to them. But not all of them stuck. 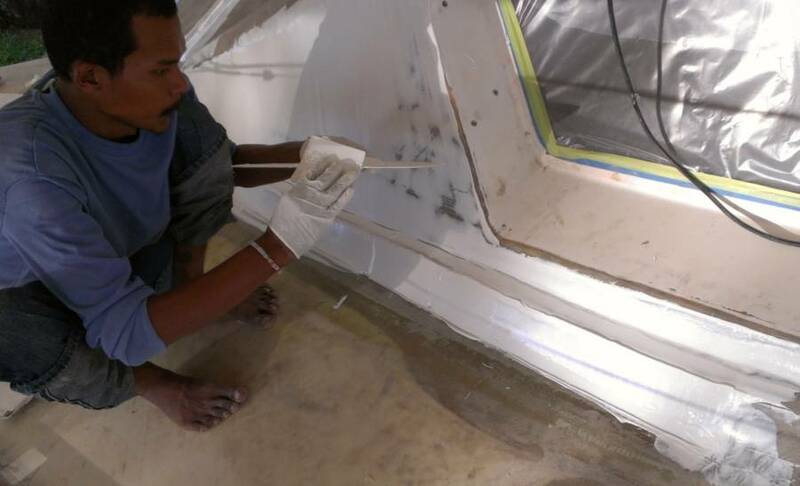 There are several ways to attack the deck preparation: one is to sand the fiberglass/epoxy decks until they are flat, then add just a small amount of filler as needed to finalize the leveling. Another way is to lay on polyester filler over all the surfaces then sand that smooth. Time and wallet say Plan A is better. 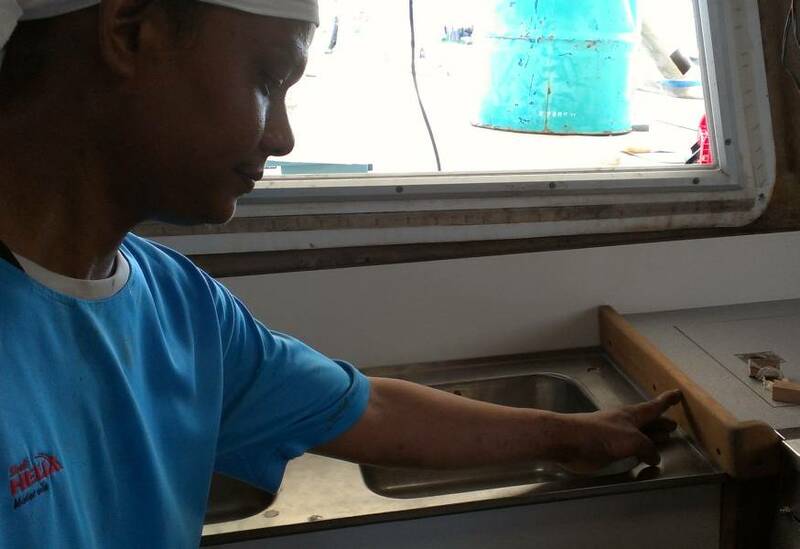 Thai thinking, and "the way they've always done it" made Plan B the one the workers chose. This was not a matter of logic, although we tried. The fiberglass‑covered decks were sanded smooth over the past few weeks, but then we've been walking all over them. We didn't see a lot of acetone going on to clean them, but we hope it did!! It was astounding how fast 4 workers can move around the boat. They basically got enough gelcoat filler laid in the morning that by early afternoon they were already sanding it! At times the boat just hummed with the vibrations of 3 "dancing" (orbital to us!) sanders. Baw worked on shaping the filler around the transition from deck to cabin‑top, which definitely needs some improvement. By the end of the day, almost all of the decks had been covered in a thin layer of gelcoat filler, and some of it was already being sanded flat. To help the guys make a nice radius curve up from the deck to the cabin‑top, Jon cut 2 sections of 4" (10cm) PVC pipe which they can use as sanding forms. Lay down some filler where it goes from deck to cabin, wrap sandpaper around the section of pipe, and sand until the transition is uniform along the whole deck. Since the sanders (and therefore the sandpaper) are not a uniform size, Jon bought lots of big sheets of sandpaper and then cut it up into the correct sizes for the sanders. Jon also worked on the autopilot and the few last fiddly jobs needed to get it back into working condition. Sue spend the day running around taking pictures, and trying to communicate with our new team leader E‑U about what supplies we'll need tomorrow. She thought she had gotten the idea across, only to learn at the end of the day that he expected us to get the materials. Oops. 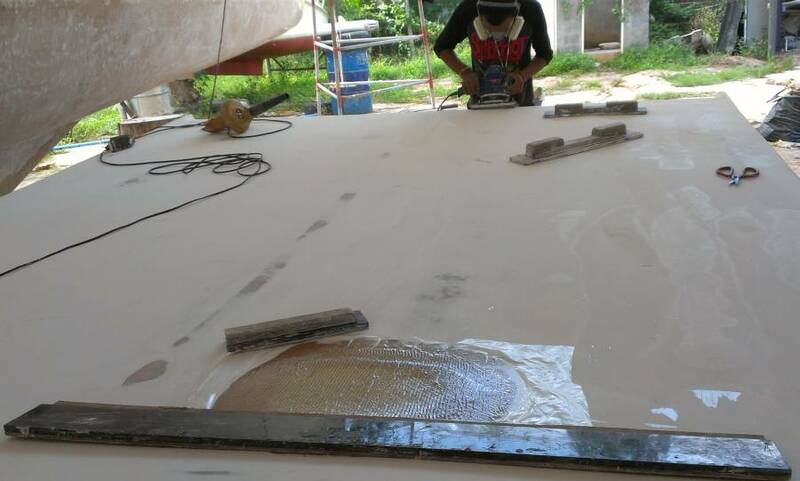 Can't do, not on our motorbike all the way into Phuket Town, and up to Phuket Fiberglass which supplies most of our silica (Cabosil), micro balloons, epoxy and polyester. So with the translation help of Cris/Num, the yard manager, we communicated our need for E‑U to pick it up on his way into work tomorrow, as he lives in Phuket Town. Sue also attacked more of the deck fittings, like the big stainless steel hinges and handles for the deck lockers. It's amazing how many of them have either bent, broken, or rusty bolts! Jon will be taking a bunch of them to our local stainless steel welder to get new studs welded on. Mike and K'Wiwat stayed for about an hour, discussing lots of details like thoughts on how wide to make the perimeters of the non‑skid, how to lay them out, and some technicalities like what to do about the aluminum toe rail. One of the things stopping us from ordering the new ISO 2500 gelcoat (very water‑resistant, non‑yellowing, and hard) is that we hadn't found a color that we liked. Sue has spent many hours on the internet and with color cards from local and international paint companies trying to find an off‑white that is pleasing. Originally, Golf convinced us to go with Ye Basic White, which he said would then allow us to match it in the future if we needed to touch up any place on the hull. In truth, it allowed him to apply a uniform color without any chance of messing up the color mixing. The local Thai gelcoat he was going to use (and that we're using as an under‑layer) comes in basic white, but has to have pigment hand added. We can only imagine the huge margin for error when trying to mix over 200 lbs (100kg) of gelcoat, and trying to get it all the same color! Our new gelcoat, supplied by K'Wiwat, is computer mixed at the factory and guaranteed to match, so that means we're free to move away from the glaringly bright "All White" gelcoat. Given that there are dozens of "off‑white" colors, Sue was pulling her hair out to chose a good one that was neither too yellow nor too pink nor too green nor too blue. By chance, Mike had a sample of a powder‑coated piece of metal done for another boat who wanted their hatches a nice off‑white. Voila! It was perfect! The sample will be sent to the gelcoat factory and will be copied for us! It has no name, so we've dubbed it "Ocelot White." Not a good day - almost the entire day was taken up with DE‑construction, taking apart things that had been previously put back together. The big blow was that about 25% of the gelcoat laid down yesterday didn't cure. It seems that the guys ran out of MEKP catalyst, the curing agent for polyester resins like gelcoat, and instead of going off to the local marine shop to get some more, they used some that had been lying around, left over from another job. Apparently it was contaminated or too old or something because this morning that batch of gelcoat was still a gooey mess, and had to be removed. This is easier said than done, as ALL of the bad gelcoat has to be removed or it will prevent future layers from curing properly. The easy part was cheesing it off with scrapers, but bits of it was still stuck in the grooves of the old fiberglass. We tried to clean it off with acetone but we think it will need pretty aggressive sanding before we can continue. We can't afford to have a problem with this layer, as we REALLY don't want to have to come back to this point. Better to do it correctly NOW, get it ALL off, so we can move forward with confidence. There are 3 affected areas: the port side deck from the back to about half way forward, the port side of the cabin‑top, and the area in front of the mast and anchor winch. Cleaning all these took all of today and there's still at least a days worth of work left. The other bit of deconstruction was done by Jon (when he wasn't digging out bad gelcoat). Although the top of the targa‑bar was nominally "finished" back in early November when Jon started mounting fittings back on top of it, the targa‑bar was done with the poor quality Thai gelcoat, in plain white. Since our new gelcoat will be an off white (and better quality ISO‑2500 gelcoat) we'll want to re‑spray the whole targa‑bar. So Jon had to remove all the fittings he'd so lovingly remounted up there. Since the gelcoat won't even be delivered for at least another week, he left the solar panels for now. It won't take long to unbolt them and move them back the 4" or so that the wires allow. But there were a few bright spots to the day. The best one is that last night Amanda came back from wandering around Cambodia with a friend. So nice to have her happy smile around us again. Houa worked on the sink cabinet. Since the new stove sticks out a bit more than the old one, that cabinet is a bit narrower, so he had to shrink the doors down a bit (or make new ones). So he cut off the nice teak on the edge of each door, cut down the plywood inside, and re‑glued the teak back on the edge of the doors. He appears to have finished both shelves, and the sink itself is now in position, although we're not sure if that's finalized. 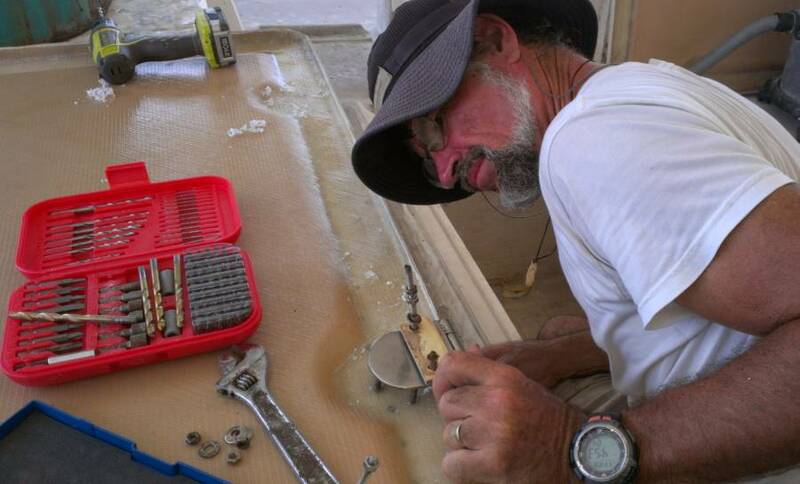 Baw put in some time digging bad gelcoat out of the deck, but he really wanted to work on the bimini. 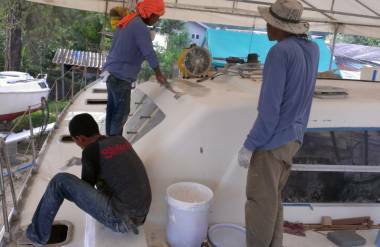 He wanted us to go off to Phuket Fiberglass to get more spraying gelcoat so he could spray a final undercoat on the bottom of the bimini, but we didn't want to take that much time away from Ocelot, so we asked E‑U to pick some up on Monday, on his way in to the yard. The bimini isn't currently a high priority as it also needs final coating with the good, new gelcoat, so a few days delay won't hurt. 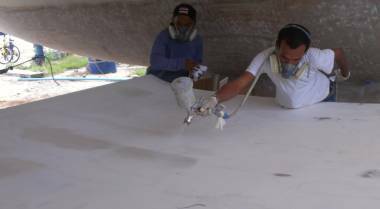 But Baw managed to find enough spraying gelcoat, rounded up some guys to drag the compressor over from another boat, and sprayed a final undercoat on the bottom and sides of the bimini. OK. The 3 of us went around to other boats looking at teak decking, as we want to decide how wide we want ours to be. Most seem to be about 35‑50mm (1.5‑2") with 4‑5mm of caulking between the teak planks. Our old teak was on the narrow side of that, but we can go to wider planks if we want. Amanda measured up the 10 areas where we want teak, so she can model it to see how it would look. It seems we have several options of where to buy good, well aged teak. Lest folks think that we're all work and no play, we should say that we had a WONDERFUL weekend, even if it was only one day. 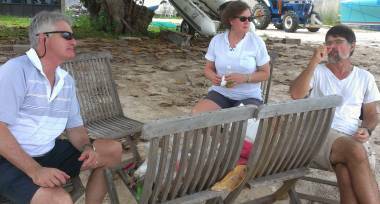 It started with a lazy morning and then a lunch invitation with our friends Daryl and Loretta on their Privilege catamaran, Cankata. The food part was fun but really only incidental to the delights of being back out on the water with good friends and delightfully interesting conversation. Daryl and Loretta have bought a condo on Phuket up by the airport, but they still want to finish their circumnavigation, so even though they're already more than half way around (they started in Ottawa) they're planning to circumnavigate and come back to Phuket! As we were leaving Cankata we noticed that other friends had arrived in the anchorage, so we asked to be dropped off on their boat. Coracle is a replica schooner built by Dirk in only 1 year out of bamboo and epoxy! We first met them in the Seychelles and Amanda had a ton of fun with their 3 girls. As we were catching up and watching the sun go down we noticed our mutual friends on Vamp coming into the anchorage. Vamp joined us for sundowners and more fun conversations, and later we went out to dinner with Dirk and Michelle at a new restaurant we'd never been to. Delightful recuperation to get us recharged for the new week.